Along with the tawny owls, goldfinches are the only models of birds made at Chelsea in the ‘Triangle Period’, 1745-49, where they were left white. Almost all the later Chelsea birds of the Raised and Red Anchor Periods derive directly from the exotic birds illustrated in the engravings of George Edwards, ‘A Natural History of Uncommon Birds, and Some Other Rare and Undescribed Animals’ published in four volumes between 1743 and 1751 which he dedicated to Sir Hans Sloane and God (Crane, 2018). One finch has a wing half raised in alarm or threat creating a lively interaction suggesting that they were modelled from life rather than engravings. This pair of goldfinches was reissued around 1750 and naturalistically coloured to conform to the series of birds after the Edwards engravings, despite not featuring in the book. The colouring is an accurate representation of the familiar goldfinch with the brown backs slightly more mauve. Much Chelsea of the earlier periods was decorated in independent enamelling studios in London as we know from William Duesbury’s ‘London Account Book 1751-1753’. Duesbury’s role as a ‘Chinaman’ in having pieces decorated is clear as he sometimes specifically states that pieces are to be enamelled. 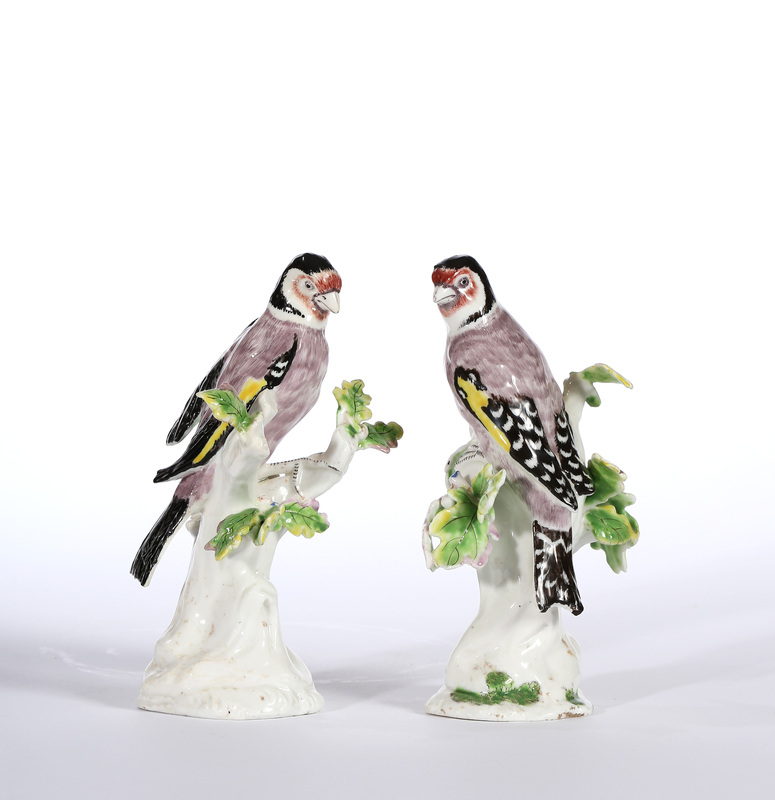 Amongst numerous other birds he lists on May 30th 1751 ‘1 pr of Goldfinches 0 – 2 – 6’, the price of two shillings and sixpence is too low for a sale price and suggests that he was commissioning their decoration. Another similarly decorated example of our finch has the typical flower painting that is usually associated with Charles Gouyn’s ‘Girl-in-a-Swing’ factory (see Elizabeth Adams, Chelsea Porcelain, 2001, p. 47, fig. 5.4), Adams attributes this figure to the St James’s factory (as did we when we sold it to her some years ago! 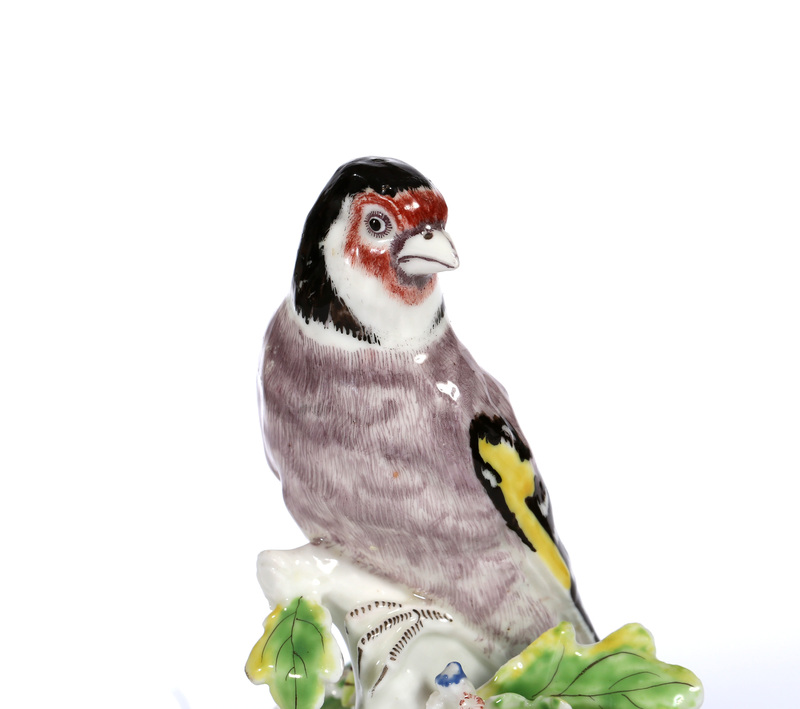 ), but we now consider this and our birds to be Chelsea porcelain but decorated by one of the same enamellers that also worked for Charles Gouyn. One other pair of coloured goldfinches is illustrated in English Ceramics: The Frances and Emory Cocke Collection, by Donald C. Peirce (1988) and can be found in the High Museum of Art, Atlanta, Georgia. 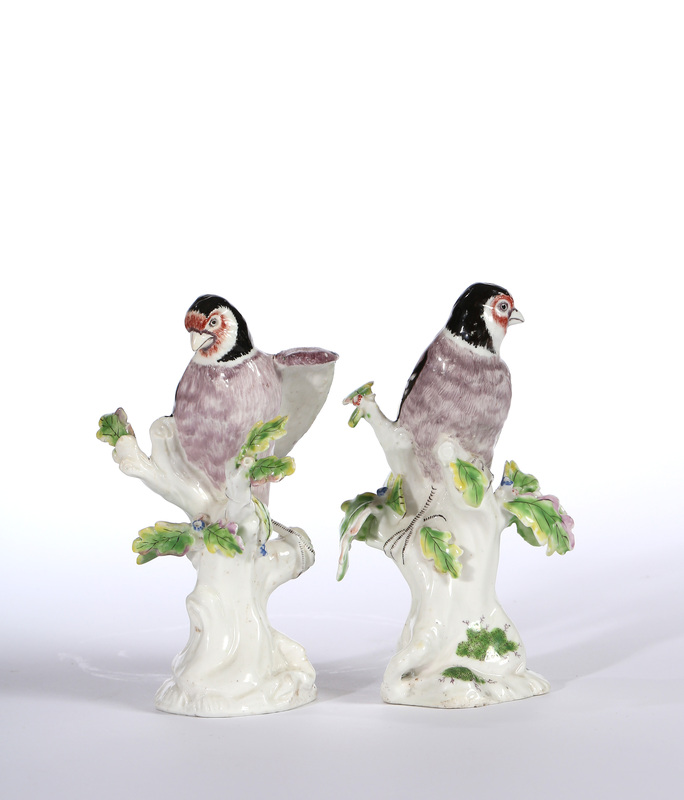 A white pair of finches from the Triangle Period was sold, Sotheby’s 17 May 1970, lot 154. Another coloured pair of finches was in the Lady Ludlow Collection, (London 1932) plate 60, no. 142 and is now in The High Museum of Art, Atlanta, Georgia, illustrated in English Ceramics: The Frances and Emory Cocke Collection, by Donald C. Peirce (1988) p. 82, no. 77. 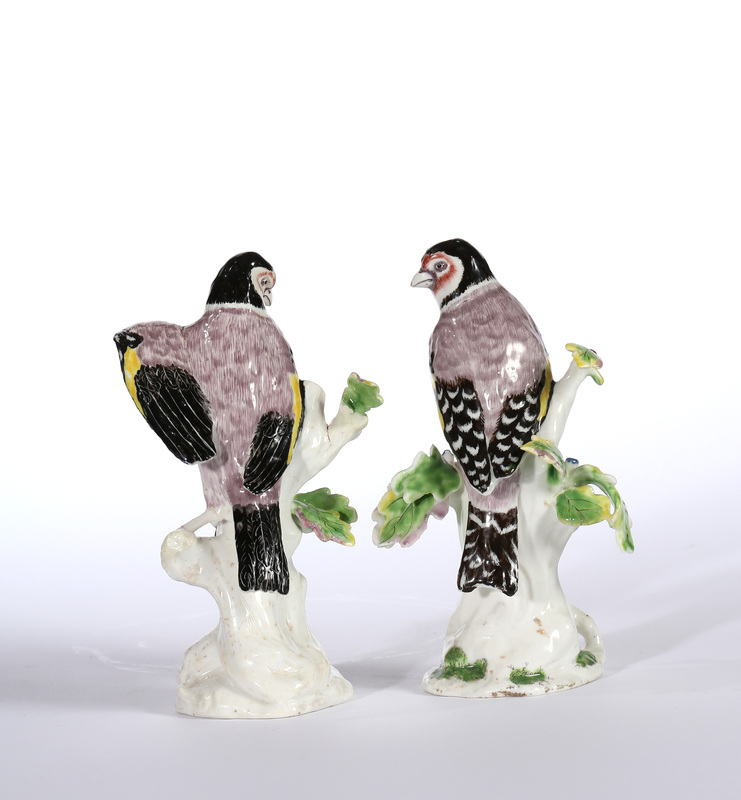 Phillips, London, 8 June 1994, lot 189, ‘An Important Pair of coloured Chelsea Raised Anchor period Finches’. Paul Crane, ‘Nature, porcelain and Enlightenment: George Edwards and the Chelsea porcelain birds’, Transactions of the English Ceramic Circle, vol. 28, 2017, pp. 31- 65. Mrs Donald Macalister, ‘William Duesbury’s London Account Book 1751-1753’ (London, English Porcelain Circle Monograph, 1931), p.11. 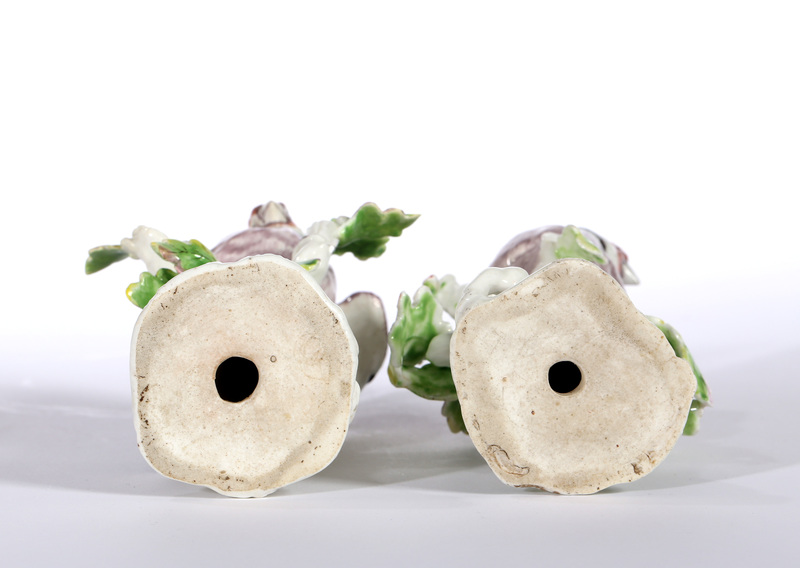 Elizabeth Adams, Chelsea Porcelain, 2001, p. 47, fig. 5.4.